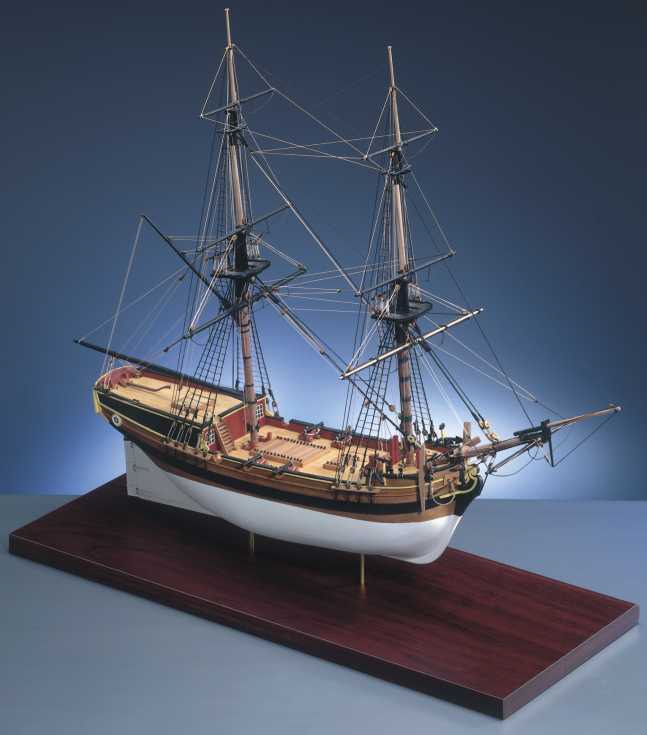 Jotika 9005 Nelson’s Navy HM Brig Supply 1/64 scale wood ship kit! The kit of H.M. Brig Supply has been designed with the Novice builder in mind. The kit is extremely prefabricated with all the wooden parts CNC cut for extreme accuracy to ensure a perfect fit. Double plank on bulkhead construction, fittings include: the Cannons, anchors, windows, blocks etc. Rigging thread in natural and black is included. The kit instructions take you step by step through the construction process. Full size plans with exploded diagrams of the various sub assemblies and comprehensive rigging drawings are provided to allow the first time builder to make a first class model. H.M. Brig Supply was launched in 1759 as a Deptford yard transport. In 1786 she was converted to an armed tender. It is in her modified form that she wrote herself into history by arriving ahead of the first convict fleet in Australian waters. She was also the first to sail into Port Jackson. H.M. Brig Supply is now known as the ship from which Australia was founded.